This morning I sit at my window as a gentle mist wets the street below. The soprano in a nearby apartment is running her scales as the construction workers across the way toil to renovate the gutted 6 story building which I am told will house tourist apartments. This morning I’ve been sorting and organizing, preparing to pack. On one hand, it’s hard to believe that my 3 month sojourn is coming to an end, on the other, I miss my children and my friends. It will be nice to come home. Sorting and organizing has led to reflection and recognition of so many things for which I am grateful. I am grateful to have a job that acknowledges and values the need to take some time to reflect, to plan, to learn, to write, tasks we often do in a rushed fashion as we negotiate the day to day, year to year realities of serving as university professors. I am grateful for the small gifts I brought with me, reminders of my friends back home, the lovely necklace and earrings my new friend Julie gifted me for my birthday the Sunday before I left, the cashmere scarf my friend Craig gifted me years ago from his trip to Peru that travels with me everywhere I go just in case, the gorgeous journals and fountain pen my friend Andrew gave me along with the mandala to help with meditation and reflection. I am grateful for those carrying on the important “things” I left behind so that I could let them go. To Michelle and Brenda for carrying the hunger awareness torch and taking our hunger initiative to a whole new level. To Matt for his vision and constant support. I’m grateful to Stefan for taking care of my turtle, to Apple for inventing FaceTime which has allowed me to hang with Alyssa and Andrew. I’m grateful to T-Mobile for giving me a mostly reasonable phone plan so that I can hear Stefan’s voice when I’m missing him or just need to check in. I am grateful to the family who rented me my dream apartment. It is more than what I hoped it would be. The brick floor and stone wall, the arched windows, the proximity to the Ponte Vecchio and the Uffizi Gallery are exactly what I wanted. The hike up the steep cobble-stone street, an added bonus that my lungs and thighs have greatly appreciated. This apartment is not perfect. If I sit on the bed wrong, it collapses. There are few lights, so the apartment is very dim at night. The air conditioners leak water on the floor. The construction workers across the street are incredibly loud from roughly 7:45 a.m. to 5:00 p.m. Monday through Friday. The intruder alarm on the construction site goes off when it rains at night. The shrill voiced foreman yells constantly and there is much more drilling and pounding on metal than one might expect. Even with all this, I love this place. I love that someone nearby plays classical piano every so often. I love the sound of the soprano running scales and singing arias. I love that a merchant tunes her radio to play 70s, 80s, and 90s pop music seemingly on cue whenever I feel a bit homesick. I love that in the window across the way, a blue globe graces a table. I love that in 3 months, local shopkeepers recognize me and wave and smile as I walk by, the man at the pizza shop, the man at the wine shop, everyone who works in the coffee shop, the staff at the cafes I frequent. They have all made me feel very welcome. I love the simplicity of my life here. I love cooking from scratch with fresh ingredients purchased that day or the day before from merchants at street kiosks or the Mercato Centrale. I love that if I don’t feel like walking, I can shop at the Conad grocery store just down the hill from my apartment. I love that I have the time to troll the streets, to write, to draw, to read, to be. I love that I have walked this city for 3 months and not put a dent in all there is to see here. I have not yet taken pictures of the icons that adorn alcoves in many buildings. I have not begun to find all the shops, churches, museums, and gardens, or explored all the windows, doors, and gates that grace this city. I love the color in the kiosks in Il Porcellino square and outside the Mercato Centrale where shopkeepers sell souvenirs, leather goods, and gorgeous scarves. I love the aroma of the chestnut roaster. I love the beautiful marzipan fruit and pastries that beckon from the windows of patisseries. I love the beautiful fresh flowers available throughout the city at daily street markets. I love the smell of coffee roasting. I love the carousel in the Piazza della Repubblica, the piazzas in front of the Duomo and Santa Croce and the Romanian gypsy string quartet that plays there sometimes. I love that when entering a piazza I might find a street festival going on. 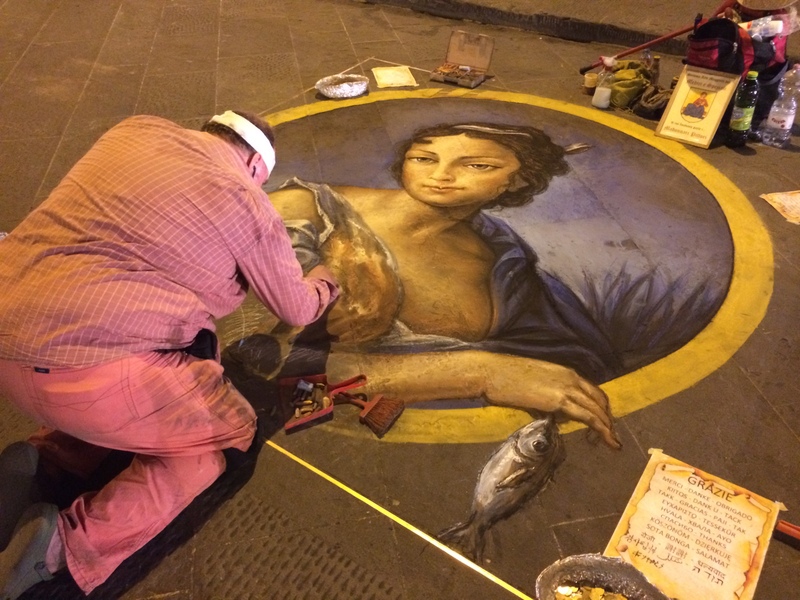 I love strolling the Ponte Vecchio in the evenings, listening to street musicians and observing the masterpieces of the chalk artists that will be washed away by midnight, only to be replaced by new works of art, generally copies of the masters, the next day. 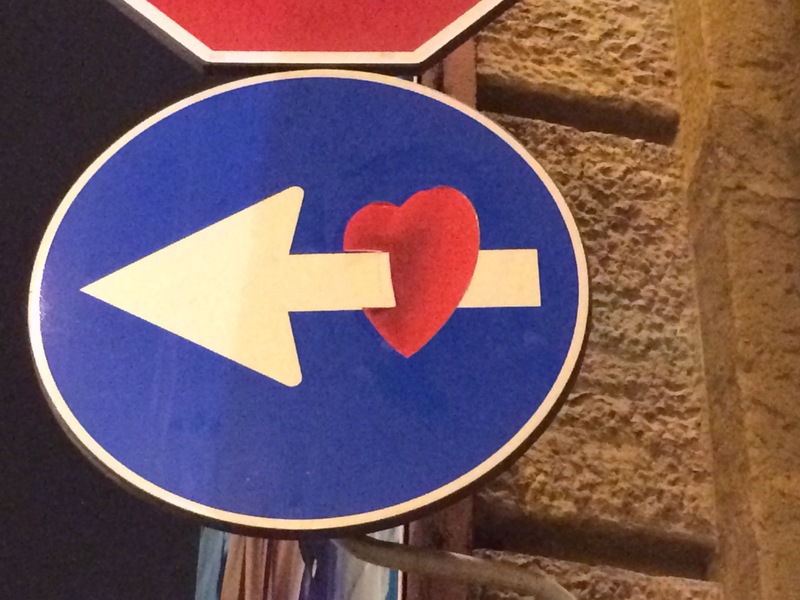 I love cappuccino, fresh pasta, panna cotta, and the creamy sweetness of gelato. 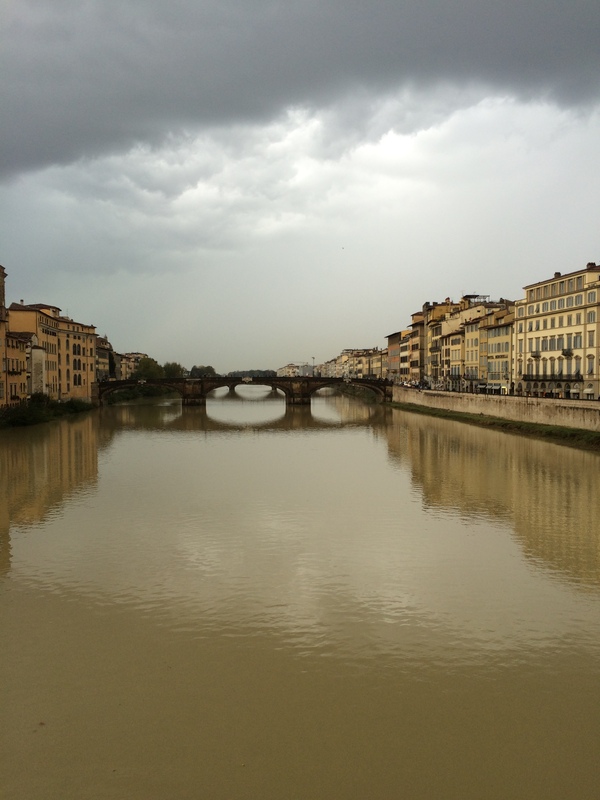 I love the bridges over the Arno River and how each has its own personality, its own unique vantage point on the city. 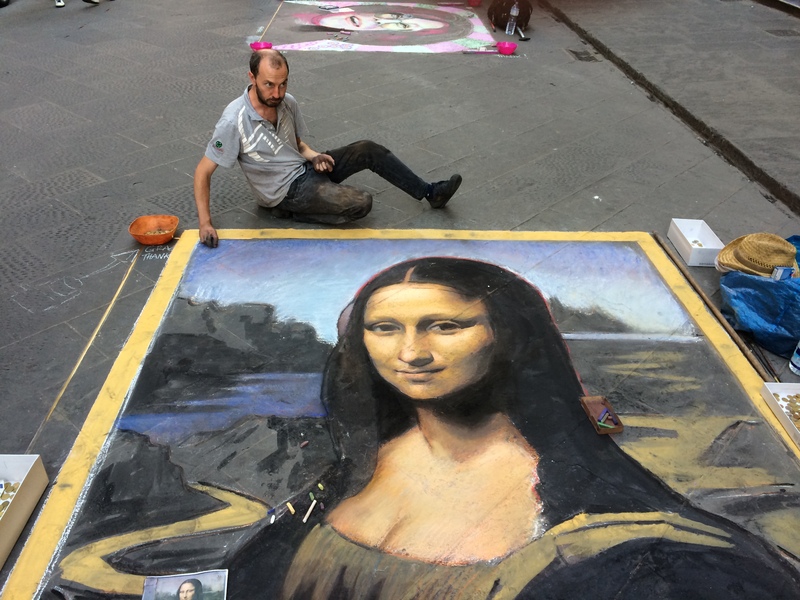 I love the Piazza Michelangelo, the hike to which is one of the most grueling and rewarding walks I’ve taken, because the vistas at the top are breathtaking as the beauty of the city of Florence lies at your feet. I love the lushness of Boboli Gardens in the center of the city. I love Emma and Iris who have welcomed this vagabond traveler, I am grateful to Marco, Jennifer, Katerina, Alex, Luca, and Marzia who have offered me a second home here and treated me like family. There is so much that I am thankful for. I am thankful for you, dear readers who have read my blog posts, commented on or liked them, or my pictures and posts on Facebook, Twitter, or Instagram. You have made me feel connected to community even when I am 5272.5 miles from home. I will end this homage to gratitude now as a cappuccino at Iris’s coffee shop with Emma awaits. This has been such an amazing adventure. A presto! 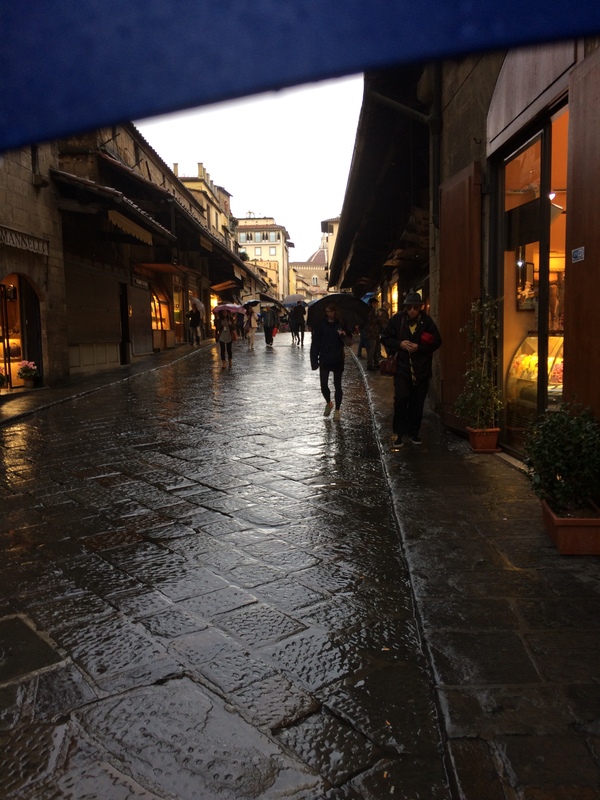 There is something magical about Florence during a warm autumn shower. I open my windows wide to listen to the sounds of the rain dancing on the cobblestones below. My apartment is 30 steps up from the street, on the first floor, in the Costa San Giorgio. Narrow and steep, the street is home to connected 3, 4 and 6 story buildings which magnify sound. The click clack of tourists’ footsteps echo in the closeness. Voices come to me quiet and muffled. I hear the muted strains of violin music from an apartment nearby. The streets call to me, at all times, but especially in the rain. I walk for hours, stopping to smell, to look, to touch, to taste, accompanied by the soft pitter patter of the rain on my umbrella. The warm, gentle breezes, far different from the harsh, driving winds of Kansas, ruffle my hair, my shawl, my rain jacket. 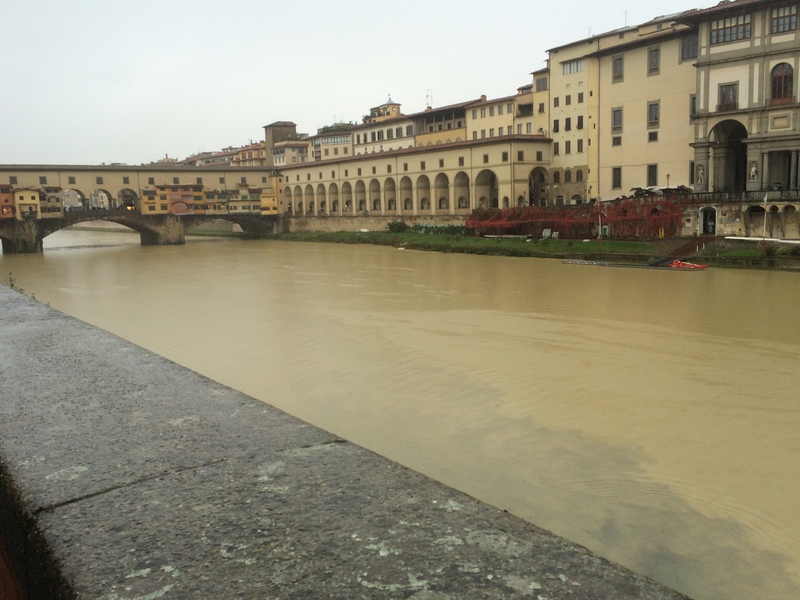 In the rain, I am drawn to the River Arno, now a muddy brown, the richness of the riverbed disturbed by the wind and rain. I walk to the Ponte alle Grazie and look back toward the Ponte Vecchio which seems a brighter golden yellow in the subdued light. 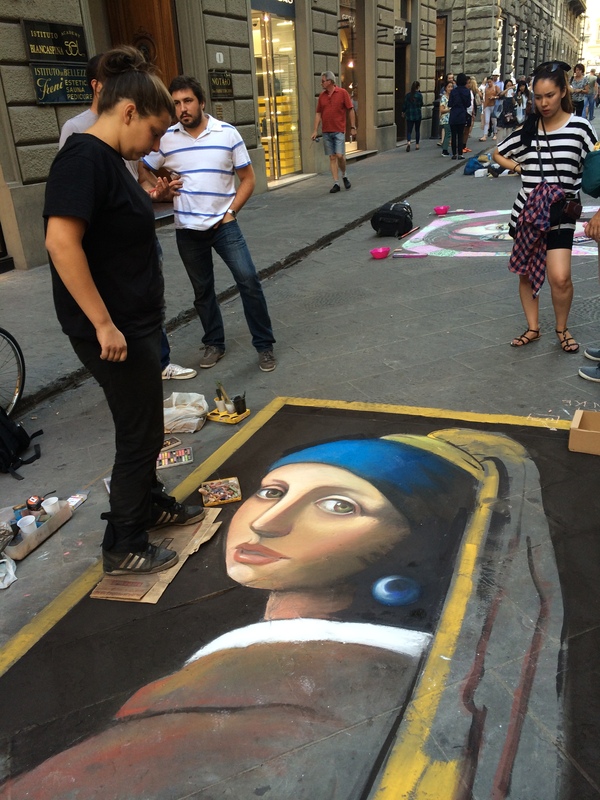 I walk the center, experiencing the colors on the Ponte Vecchio and the Via Tornabouni, where Monte Blanc pens, Tiffany jewelry, Gucci, Salvatore Ferragamo, and Roberto Cavalli clothing and accessories sport the season’s newest colors and styles. The brightly colored umbrellas of tourists a sharp contrast to the rich greys and browns of the streets. I walk into the Coin Department store where a young sales clerk invites me to a sink to try the newest shower gel and salt scrub. I visit the Swarovski crystal department and look at bracelets. 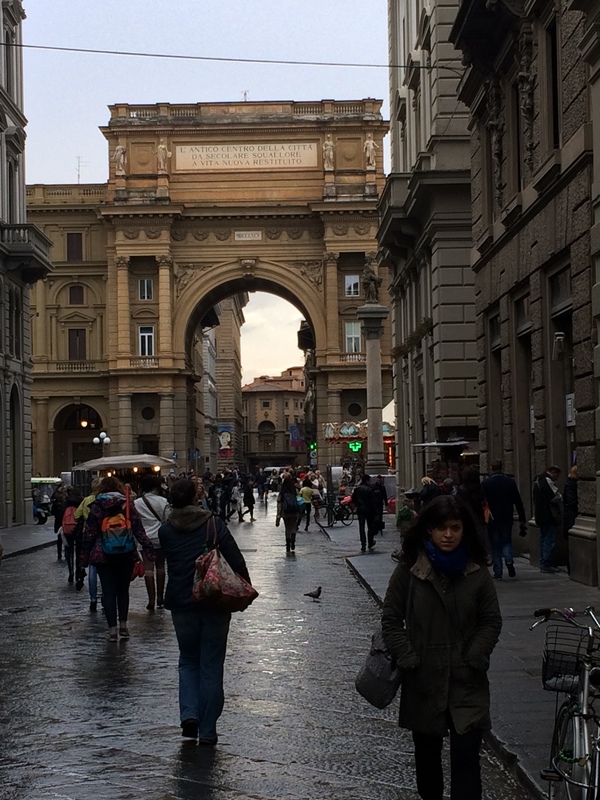 I leave the store and head toward the carousel in the Piazza della Repubblica, still now, in the rain. I walk to the Red Bookstore where I decide to sit for a while to read. After a brief stop, I’m reading the newest Bridget Jones book by Helen Fielding called Mad about the Boy and her writing makes me laugh out loud every few paragraphs, so I don’t feel I can stay in the bookshop long for fear of disturbing other readers, I again hit the streets. 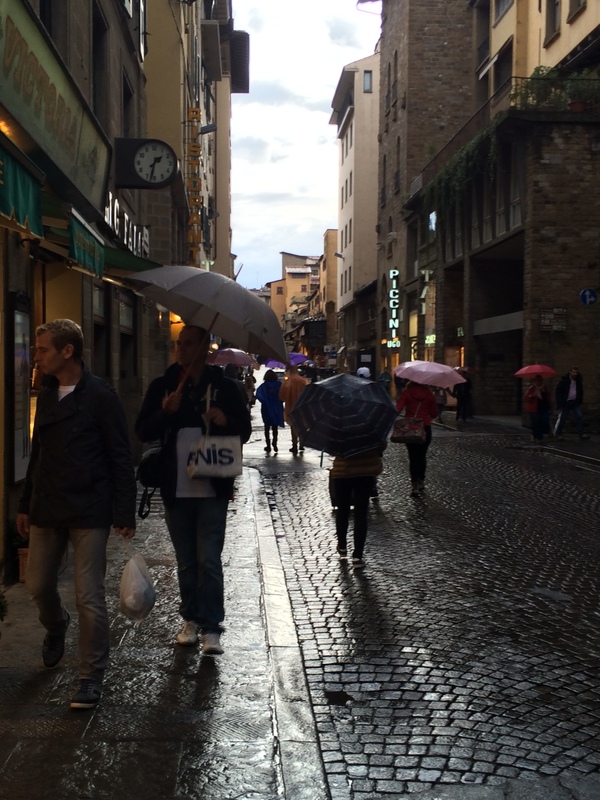 I head toward Piazza Santa Croce, water running down the trough in the center of the rain soaked street. Bright, welcoming lights from shop windows beckon. I reach Santa Croce Piazza and stop at the Finisterrae Pasticceria to look at the lovely pastries. The last time I was in, I sampled a delicious, rich, dark, creamy sipping chocolate, offered by a barista whose eyes were the same chocolate color as the drink he handed me. I settle on a cappuccino and 4 bite-sized cream puffs, one chocolate, one hazelnut, one crème, and one pistachio. The same barista hands me a cappuccino with a lovely flower design and three sugars, in contrast to the usual one. He remembered how I drink my coffee. I like that. I sit at a table across from the pastry and gelato counters and page through an Italian newspaper. The pastry bites are light and flavorful. The cappuccino warm and bitter. When I leave, it is dusk and the rain has stopped. Everything is wet, shining, and washed clean. 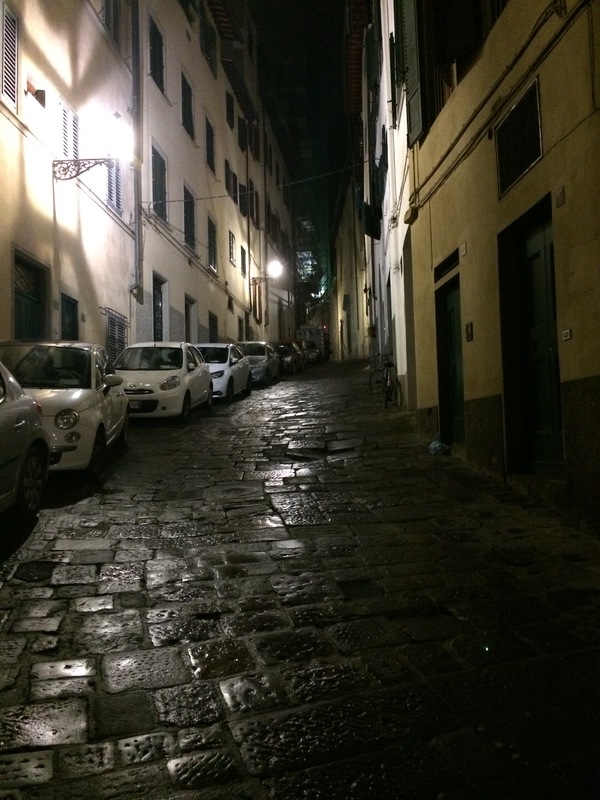 The soles of my shoes squeak on the wet stone streets as I head to Caffé Giacosa for aperitivo. I may have a wine spritzer tonight, but my real draw is the luscious, buttery olives, the spicy corn nuts, the tapenades, and the carrot sticks. I have been away from my apartment for 5 hours. Time flies as I troll this city spontaneously deciding minute by minute where to wander next. I walk home, up the steep street to my apartment. Tomorrow it’s supposed to rain again. 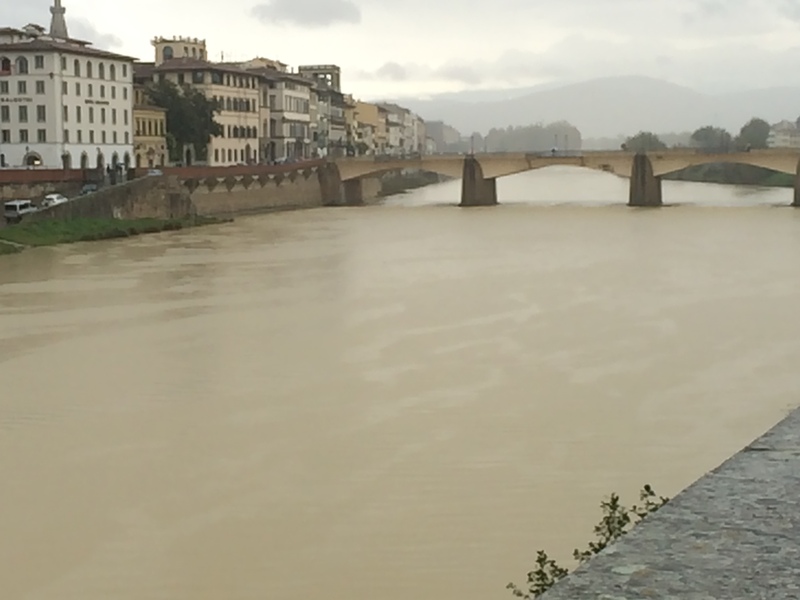 Maybe I’ll walk to Piazza Michelangelo to get a panoramic view of the city and then to La Carraia on the Ultroarno side of the Arno River near the Ponte alla Carraia for the best gelato I’ve found yet. Who knows where my feet will take me. So today, after an incredibly productive day of taking insightful workshops (about 5 hours worth), I decided to head out and “troll” the city. There was so much going through my head and I just wanted an energy shift, time to just “be” in this lovely city. I trolled the city for 3 hours. When I troll, I walk wherever my feet take me with no plan and see whatever presents itself to me. 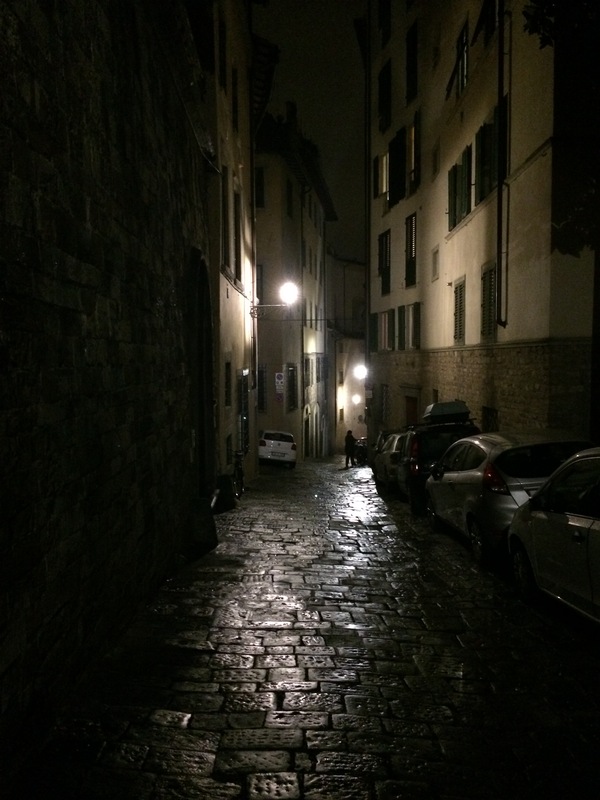 It rained again today, so the stone streets were wet tonight. I walked, looking in shop windows, stopping to listen to street musicians, saying hello to friendly shopkeepers. I stopped to watch several hundred people run by me who were participating in the Florence Run (an 18K run – or about 11.25 miles). 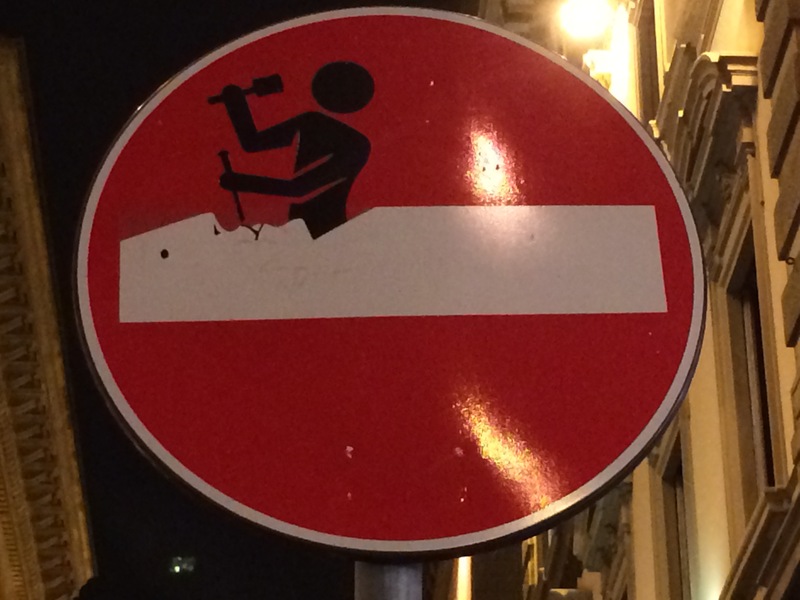 I trolled looking for sign art, a transient production by a group of artists who decorate street signs that are cleared off almost immediately. 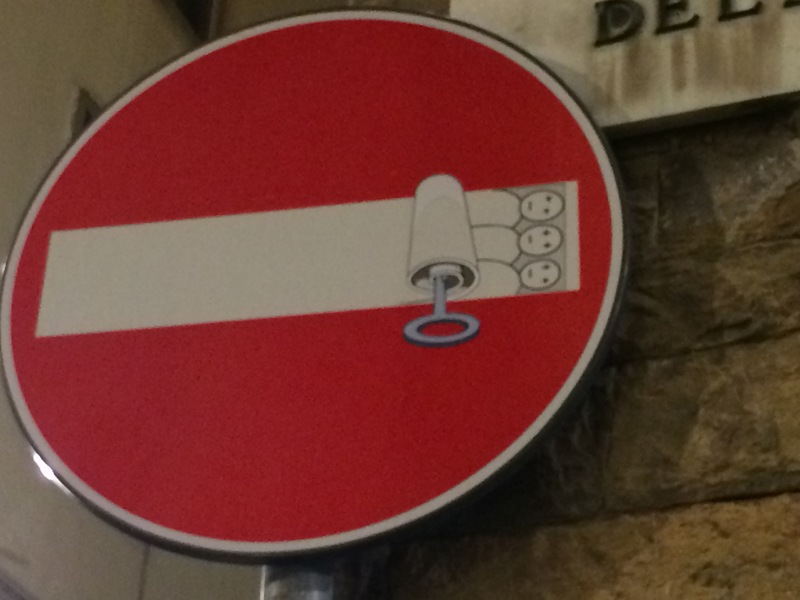 These are such an amazing complement to the pastel street art that occurs every day (if it’s not raining). And there is music everywhere. 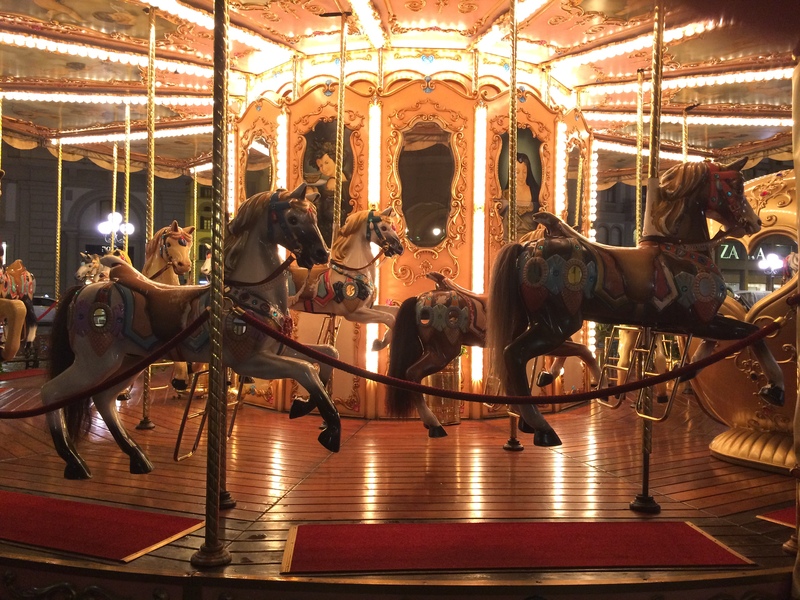 I trolled the carousel in the Piazza della Repubblica, one of my favorite spots. A young man handed me a tissue so I could wipe off a bench and sit for a while. One of my hopes when I came here without knowing the language and without knowing anyone was that I would learn to slow down, to reflect more, to get better at just “being” and not “doing”, to harness my extroverted side, to give expression to my introverted side. In my “real” life, I move quickly and get a lot done. I seldom reflect on what I’ve done before careening into the next thing (or the next 10 things). I have come to realize that for me this is a learned pattern. I have always striven to be productive, to be the best I can be. Often in my life, this has translated into doing as much as I can as quickly as possible. I am also a perfectionist. Getting “it” done isn’t adequate. I have to do “it” as well as I possibly can, whatever “it” is. My drive is one of the reasons I’ve been so successful in my life. I have found a different rhythm in this city than I have at home. I walk slower. I look around all the time. I soak in the city. I am delighted to have had the chance to share some of this beauty with you, dear reader. For myself, my photos and writings will fuel my memories and be reminders of this time when I am back home. I hope they will also be reminders to maintain the calmer, more relaxed pace I’ve found here. I’ve found, among other things, that when I slow down I am almost as productive as when I’m moving at the speed of light back home. Is it any wonder that I am inspired to write by all the beauty, art, and wonder in this city? 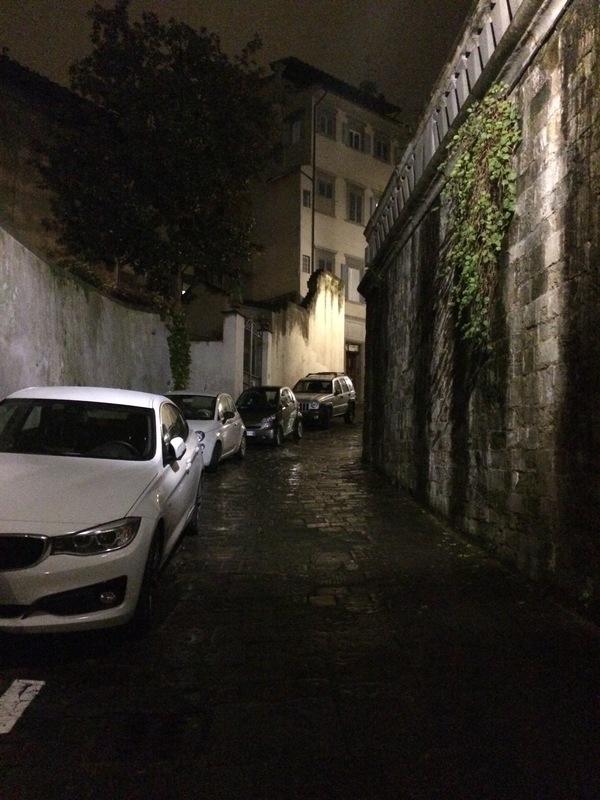 I walked home tonight, more slowly than I would at home, up the steep, street to my apartment. I am so blessed to have this time. 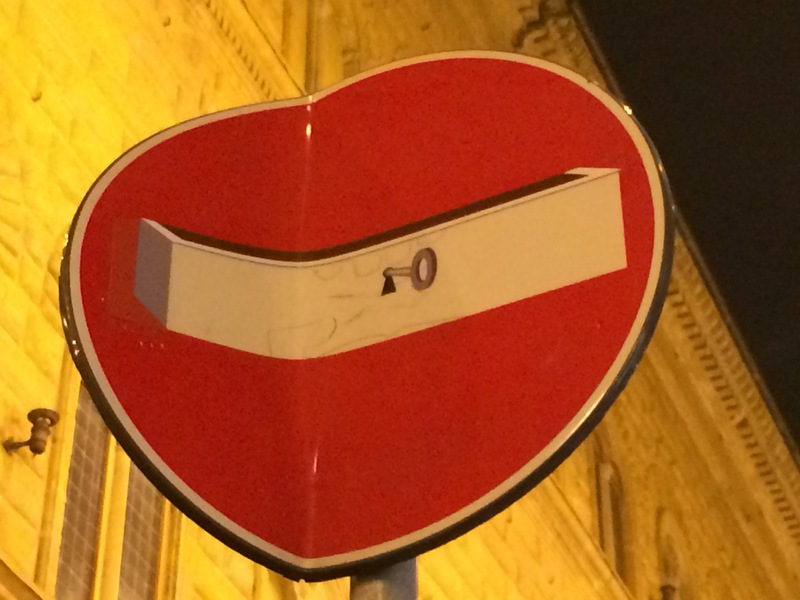 A presto (until next time)! 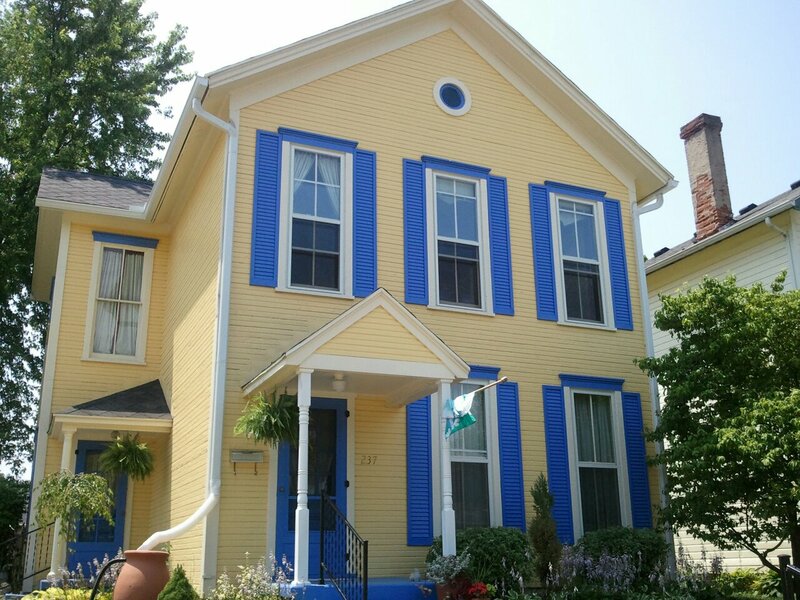 I was born two months premature in the front bedroom of my grandparent’s house on Lafayette Ave in Urbana, Ohio. My mother, who had turned 19 years old two weeks before, was alone during her labor and my delivery; her parents were “out west” on vacation. When she realized what was happening she called a friend, who called a doctor, who came to the house. After my birth, I was rushed to the hospital where I stayed for the first month of my life. Weighing 3 pounds at birth, I had to reach the 5 pounds that would allow me to go home. From what I am told, I was lively, feisty, and alert from the first. I charmed everyone. As a child, I was well loved, especially by my maternal grandparents, particularly my Poppa. He was the “unconditional love” person in my life. Poppa and I had the kind of connection I share with my son, effortless. We simply understood one another. Poppa died in 1974 when I was 16. He and my grandmother had started wintering in Florida several years before. Grandma had severe arthritis and the damp, winter cold of Ohio was too hard on her. We didn’t know that Poppa was ill before they left, but there was something between us as we said our goodbyes and hugged for the last time. I think both Poppa and I knew we wouldn’t see each other again. As my mother and her brothers made plans to bring him home, I knew that he would not make it. I sat down and poured out my heart and my love in a 14 page letter. Only after his death did I realize he hadn’t received my letter. The hospital returned it to my grandmother and she gave it back to me, unopened. I burned it as a goodbye to my Poppa, again precious words lost to the ashes. I wish I knew what I’d written, but that letter was a gift to my Poppa, not to me. For months, I would laugh at a story or see something interesting and think “I have to tell Poppa”, only to realize that he was gone and that we wouldn’t get the chance to laugh together over whatever silly thing had happened or interesting fact I’d learned. As I understand it, my first words were “bite butter” and my Poppa gave me a bite of butter, the first of many. Poppa stayed with my sisters, my brother and me during the summer months while my mother worked. He sat for hours, day after day on the deck at Meadow Lake in Ohio watching my siblings and me swim and hang out with friends. I have trouble understanding that kind of commitment, that kind of comfort in just being someplace. As a child, I loved bedtime stories, particularly those my Mother and my Poppa told me. Once they told me a story, I remembered it word for word and if they changed it even slightly the next time I asked for that story, I corrected them. As a mother who told my own children stories (and was corrected by them if I changed plot lines or wording, I know how difficult it is to tell the same story the same way each time, especially if you are making it up on the spot). I must have been quite a handful. I wonder if this is why they started reading me books. For me, books were magical. From those letters on the page pictures and movies emerged. I could see what they read. I could not wait to read. I wanted to be able to make those pictures and movies happen too. I got my love of reading from my Grandma, as well as my love of culture and history. My Grandma told me I could read by the time I was 3. She helped me learn by teaching me to pick words out of newspaper articles. She gave me a red pencil and I would circle the ones I knew. I could pour over a newspaper for hours at the table in her dining room. Then, when I was ready, she would point to each word, ask me to read it, ask me what it meant, and ask me how to spell it. She also taught me to try to understand the meaning of other words through the context of what I could read. Later, she gave me abridged versions of classic novels. They came in a series and I loved getting the next one. Through this series, I read the books that would have the greatest impact on my early years, Wuthering Heights, Pride and Prejudice, The Hunchback of Notre Dame, Little Women, Great Expectations, The Count of Monte Cristo. I loved entering the world of a book. I still do. These books also taught me an appreciation of the complexities of the world, from unrequited love and oppression, to unfairness and hypocrisy. They taught me to treasure fairness, justice, love, compassion, a strong work ethic, and care for others. When I was 14 years old, my grandmother took me to see the movie Nicholas and Alexandra about the last Czar and Empress of Russia. I have no idea why she picked this movie, but when it was over she said, “I have never been able to travel outside the America. You will. Someday you will go to Russia.” I think my love of travel was born in that moment. Later, I would live in Russia for a year, on a Fulbright Fellowship teaching at Kazan State University in Kazan, Tatarstan, Russia. From my Grandmother, I also learned that I have an almost photographic memory. This skill runs in my family. Once I learned a word, I never forgot it. When I would try to remember things I’d read my grandmother would say, “Picture the page in your head. Can you see it? Ok, read it”, and I would. I had no idea this was unique. I thought that if I could do it, everyone could. This later made memorizing speeches during forensics in high school and college very easy. To this day, I can picture pages in my mind and read them to myself. I’m lazier with it now. This is one gift I haven’t refined. Perhaps because I read so much I don’t want to picture or remember everything. I just want to know where I can find it again later if need be. When I was little, after my bedtime story, and before I went to sleep, I loved to have my back rubbed, and my Poppa or my Mom would rub my back as I fell asleep. This is likely why I love massages so much today. This is likely the foundation of my tendency to show physical affection easily and liberally. I’m a hugger, a toucher. I know how important touch is to health. 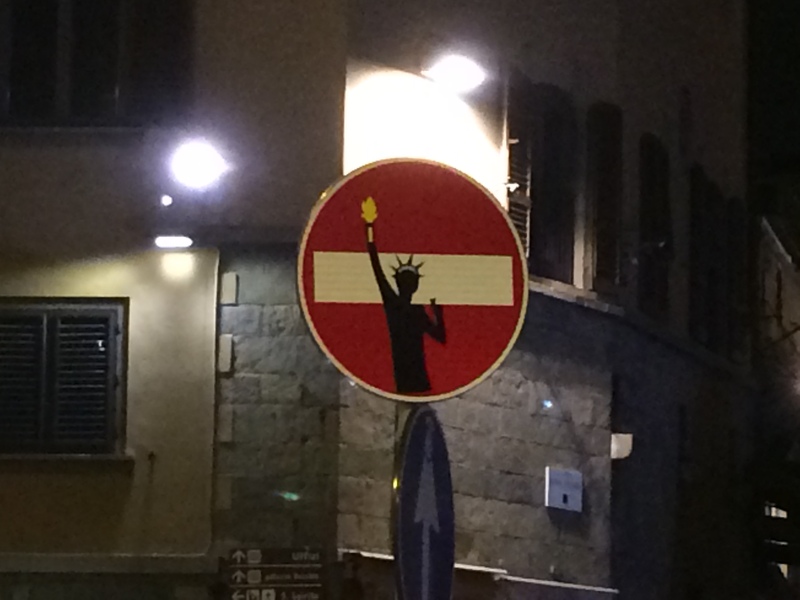 Posted in Florence, Italy 2014, Reflections, Who am I? On why I LOVE Daylight Saving Time! Ok, so while I’m in Italy this year on a writing retreat and not teaching, “Fall Back Day” will not impact me as it usually does. However, I’m still happy that the European Union, like the U.S., and a total of 70 countries worldwide, practice Daylight Saving Time! Like many of you, I often feel like there are simply not enough hours in the day to do everything I need to do. So often I wish for just one… more… hour… Once a year, I get that hour and I “feel” as if I have more TIME. I wake up earlier. I am productive longer. I feel like there is TIME to get things done. I even feel as if there is TIME left over at the end of the day to relax! That is why “Fall Back Day”, the glow of it which carries me for about 7-10 days beyond the actual day, is my favorite day of the year. So, why Daylight Saving Time? Did you know that Benjamin Franklin, the U.S. inventor and politician, first proposed Daylight Saving Time in 1784 and that Germany was the first country to implement it in 1916? It took a while to catch on. Also, Daylight Saving Time hasn’t always been an hour. Sometimes it’s been ½ hour or 2 hours http://www.timeanddate.com/time/dst/. The original idea was to maximize the daylight hours and, among other things, reduce energy expenditures. Conserving energy in times of war has been the most common reason for the implementation of DST over the years. The general consensus in study findings seems to be that even though we get up in the dark in the fall, the extra energy used then is more than offset by the energy saved by having an extra hour of daylight in the evening. I can only speak to having more energy myself for 7-10 days and getting more done. On April 30, 1916, Germany and Austria became the first counties to use Daylight Saving Time to conserve fuel needed for electricity production. They advanced the clock one hour until the following October. 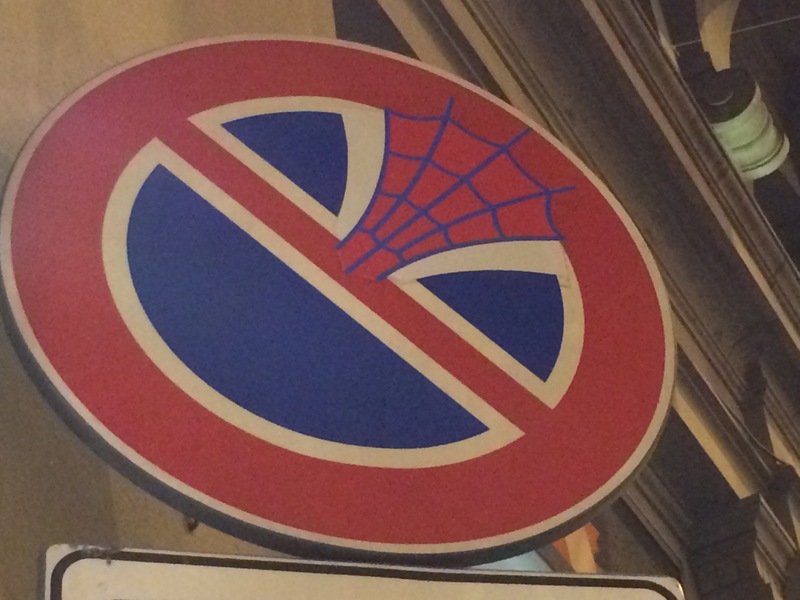 Other countries including Belgium, Denmark, France, Italy, Luxembourg, Netherlands, Norway, Portugal, Sweden, Turkey, and Tasmania adopted the same policy. Great Britain, Manitoba, and Nova Scotia followed later in 1916. In 1917, Australia and Newfoundland began saving daylight. The U.S. didn’t hop on the bandwagon until March 19, 1918 when “An Act to Preserve Daylight and Provide Standard Time for the United States” was enacted. http://www.webexhibits.org/daylightsaving/index.html. That first pass at DST lasted 7 months until Congress overroad President Woodrow Wilson’s veto to end it. During WWII, Daylight Saving Time reappeared, again as an energy conservation measure and it lasted in the U.S. from February 9, 1942 until September 30, 1945. From 1945-1966, U.S. states got to decide if they wanted to observe DST or not. On April 12, 1966, President Lyndon Johnson supported, and Congress approved, the “Uniform Time Act”. The only way around Daylight Saving Time then was for a state legislature to determine that an entire state would stay on Standard Time. In 1972, Congress allowed states with more than one time zone to decide independently for each time zone whether or not to follow DST or stay on Standard Time. On January 4, 1974, during the Vietnam War, President Richard Nixon signed into law the “Emergency Daylight Saving Time Energy Conservation Act of 1973”. Congress amended the Act, and Standard Time returned on October 27, 1974. Daylight Saving Time resumed on February 23, 1975 and ended on October 26, 1975. In 1986, Congress decided that DST would begin at 2:00 a.m. on the first Sunday of April and end at 2:00 a.m. on the last Sunday of October. Some areas in the U.S. don’t observe DST, specifically, Arizona, Hawaii, American Samoa, the Commonwealth of Northern Mariana Islands, Guam, Puerto Rico, and the Virgin Islands. The “Energy Policy Act of 2005” extended Daylight Saving Time in the U.S. beginning in 2007. Since 2007, DST begins at 2:00 a.m. on the second Sunday of March and ends at 2:00 a.m. on the first Sunday of November. In the EU, DST begins at 1:00 a.m. Greenwich Mean Time on the last Sunday of March and ends at 1:00 a.m. GMT on the last Sunday of October. That means that in Italy, I get my extra hour a week before you get yours in the U.S. I’m not totally clear on the implications of tha, but I’m hoping to figure out a way to get both “fall back” hours. Anyway, that’s the scoop on Daylight Saving Time. The rumor that a bunch of Congressmen getting drunk in a bar decided to dupe the American public has no merit. Check back with me next spring. I’m likely to be a bit less exuberant then, when I have to give my hour back, than I am now when I get one for free. Ciao and enjoy that extra hour of sleep! I write to you at the end of an absolutely beautiful, warm, autumn day. It was sunny, but not too hot and there was an almost constant gentle breeze blowing. 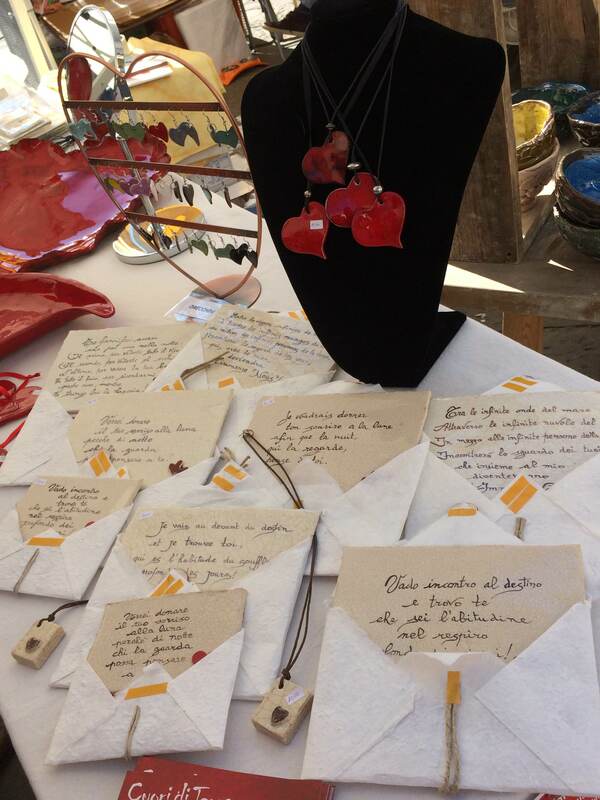 It was the perfect first day of the 15th International Ceramics Fair in Piazza Annunziata. It also runs tomorrow from 10-7. Sponsored by the Arte della Ceramica, the fair began in 2000 as a venue for ceramic artists from throughout Europe to show and sell their work. 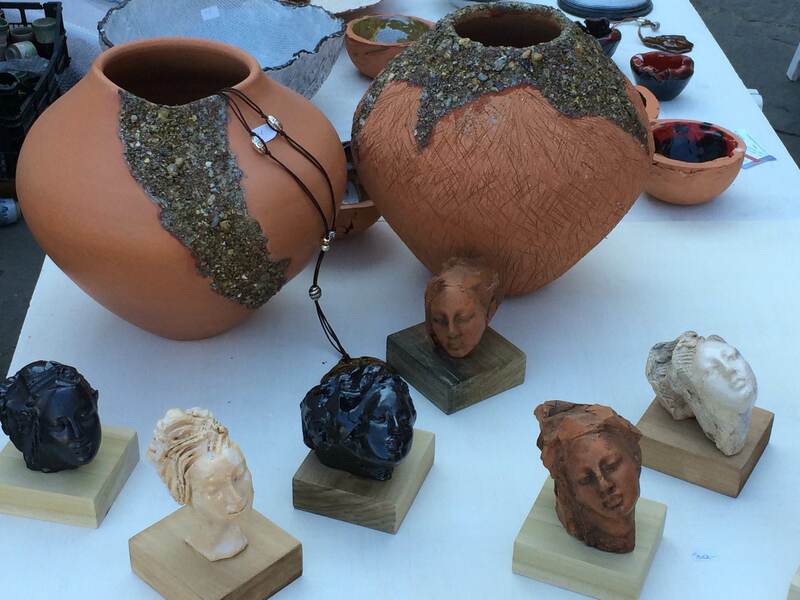 This year the fair includes 68 ceramic artists from Austria, France, Germany, Italy, Spain, and Slovenia. In this post, I will simply let the beauty of the artwork speak for itself. These are just a few of my favorites. 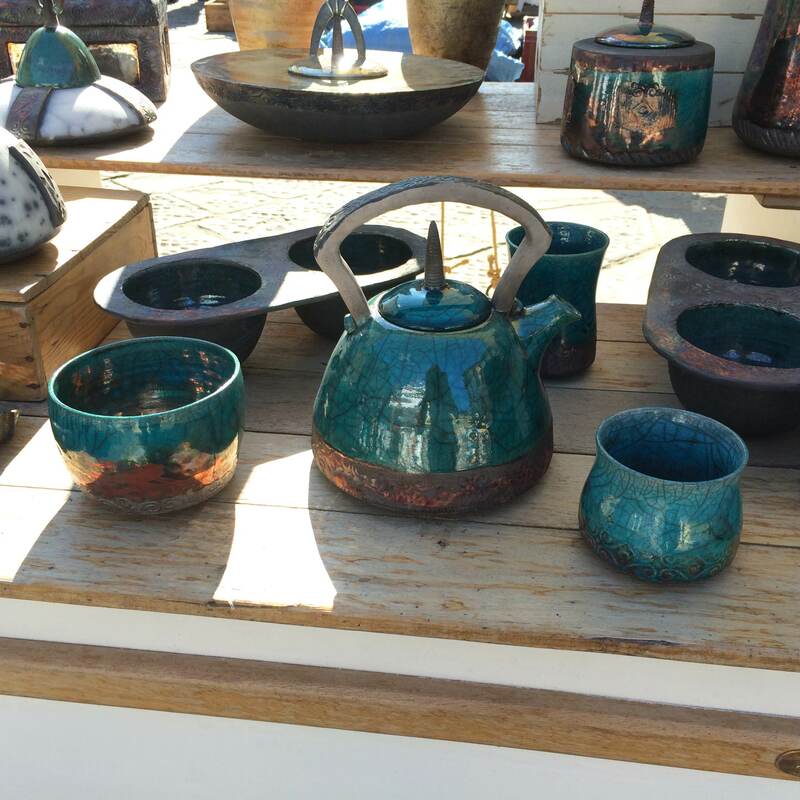 Beautiful raku pottery by Christina Perrin of France. christine.perrin80@sfr.fr. There are so many more examples I could show! The variety and creativity are impressive. While I generally take more general photos at events, today I wanted to feature the actual work of some of these artists and to do so, I gained their permission and credited them directly for their creations. The intellectual and creative property of an artist is her or his ideas made manifest. It is delightful to be able to share some of their genius with you. 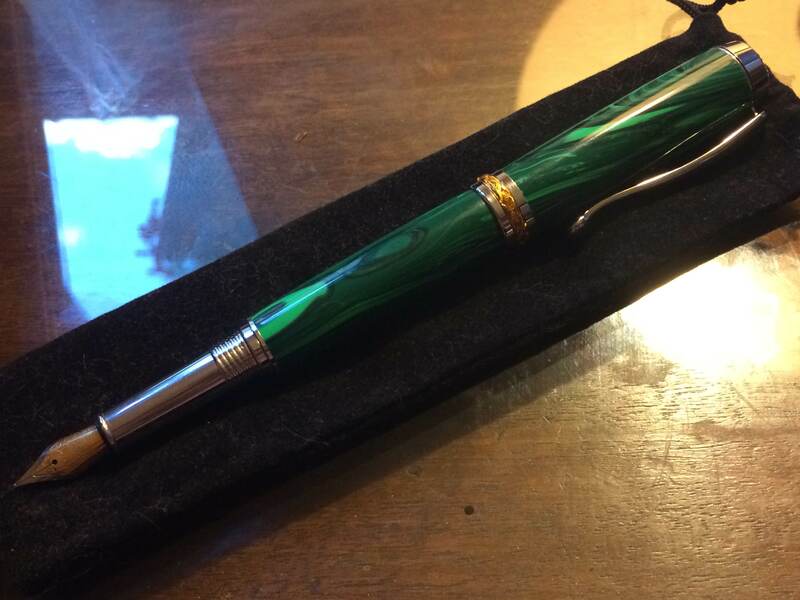 I start this journey through Florence, Italy by thanking my friend, Andrew O’Leske, for my gorgeous journals and my hand-tooled fountain pen. I played with fountain pens a bit during art class in high school, but I have never really written with one. The journals are beautiful and inspiring. 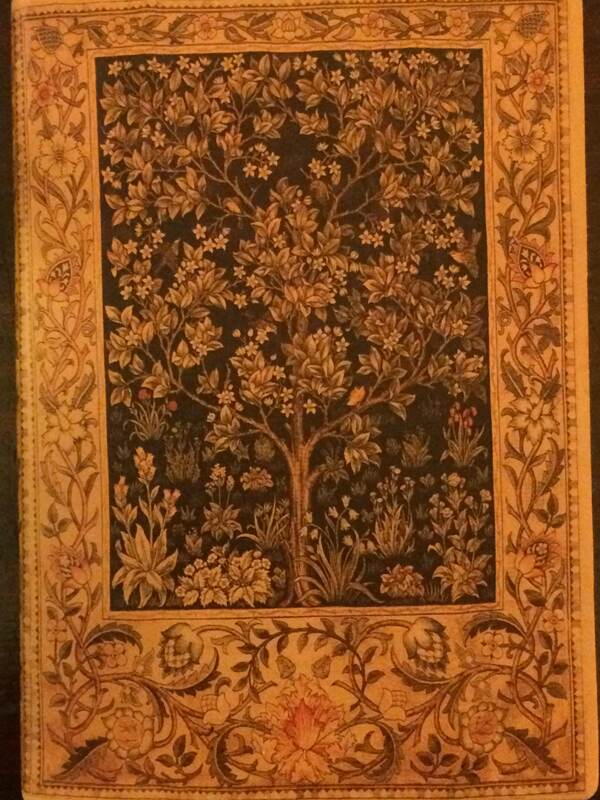 The first is leather bound with a detailed tree of life on the front and back covers, and intricate scroll work surrounding them. It was handmade in Italy. How appropriate. When I held it in my hands, it spoke to me of possibility and responsibility. It felt weighty, yet full of potential. 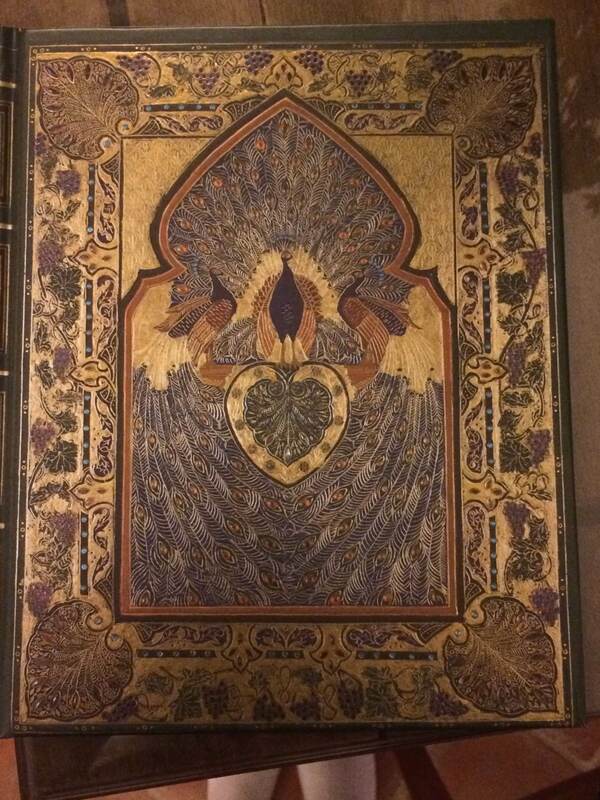 The second is hardbound and a reproduction of a journal titled The Rubdiyat of Omar Kkayydm which was created by Francis Sangorski in 1911. The original was encrusted with jewels. It went down with the Titanic in 1912. This exquisite journal spoke of familiarity and confidence. It would be a place where I could easily write. My lovely pen offered articulate elegance, if I can learn to use it properly. So far, this has turned out to be a more complex task, on all levels, than I anticipated. Sabbaticals are about retooling, about visioning possibilities, and about new beginnings. 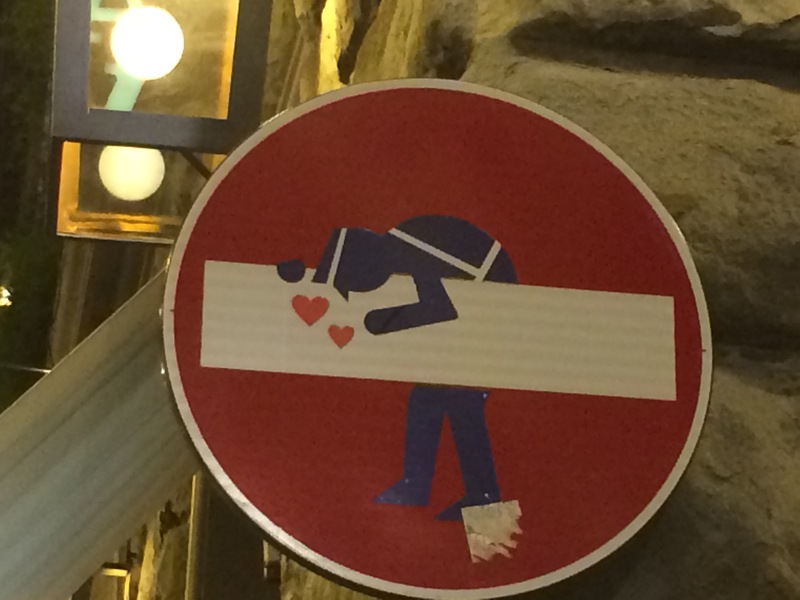 My trip to Florence is the same. This is an interesting moment in my life. My daughter finishes her undergraduate studies in psychology and communication in December. My son is positioning himself for management in a job he loves. I have accomplished everything I have set for myself to this point. I look to the future and delight in the opportunity to consider possibilities for the next phase of my life. This time is for me. How often do we take the chance to sit with the possibilities in a glorious, inspiring place? I know I have never done anything quite like this. I have the gift of time to ponder what will give me joy, fulfillment, purpose. I have the time to reflect on what has given me these things in the past. The answers, in fact, the questions, are not yet clear. I cherish the time to vision, to consider, to contemplate. I look forward to sharing this adventure with you, dear reader.